To some, life may have been a box of chocolate, but for Melbourne comedian, Lauren Bok, life is like a burrito. "We’re born, we are shoveled into a channel of carbohydrate, and the weight of life's commitments are thrown on top of us. The Cheese of Career. The Tomato Salsa of Broken Dreams. The Guacamole of Expectations. The Sour Cream of Regret," she says. Which leads us to her festival show, aptly titled Is That A Burrito In Your Pocket Or Are You Just Happy You Have A Burrito. This is Bok's solo debut show for the festival desperate beings a seasoned stand-up and comedy performer for a number of years. 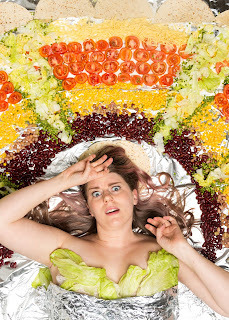 "I finished doing the sketch show Wander Women for the Melbourne Comedy Festival, and while I had an amazing experience collaborating and being a sketch performer, I missed stand up. Melbourne Fringe registrations opened up the week after and it felt like the right time to just go out and do my own thing, my own way. I felt sick with nerves doing it, but I registered quickly without telling anyone, then it was done, so I had to just go through with it!" She explains. "It feels different then other festivals as it's just me, without any other influences. That makes everything a lot quieter on the outside, but a lot louder in my head." Stuffed full of skits, a bit of cheese and the spicy hot Bok, the show will be full of the witty, physical style comedy she is known for. “I’ve been wrapped up in filling the show with jokes,” Bok says. “I’m spilling the re­fried beans on things I’ve wanted to taco about for a while. In the past I’ve tried not to be too corny, but I’m ready to roll, go the full enchilada and get jalapeno face.” Oh, and there's puns too. Over her four years of stand-up, Bok has built up a lot of material, confidence and experience that she has poured into this show. "Comedy is when the audience laughs, so I spend time in front of audiences finding the best way to tell a story or joke. I've also got more experimental ideas rattling around in my head and a full length show for Fringe gives me the opportunity to get more creative, which I'm really excited about!" Out of curiosity, I ask Bok what the best burrito she has ever had is, and her answer proves that if you put it out there, the Universe will reward you. "Once I didn't have dinner before a show, ended up at a club until they kicked us out. I woke up the next day and taco truck was around the corner from my house. It was serendipity covered in cheese." That's a wrap.